Workshop is limited to 15 participants. Register early to secure your spot. *Maine teachers: see sidebar for information on scholarship opportunities. 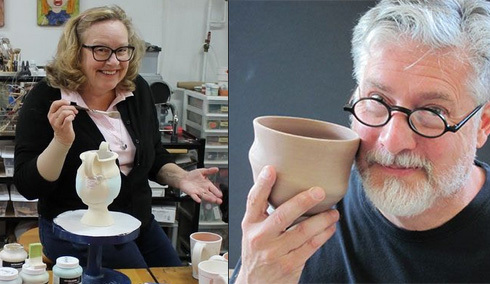 Join nationally-recognized ceramic art educators David and Tracy Gamble in the Watershed studio during this special course for art educators. The week-long workshop will focus on construction and surface decoration through completion of five projects—clay masks, sushi plates, image transfers, landscapes on bisque tiles, and brush making. Ample studio time will enable participants to hone their skills and explore ideas to take back to their classrooms. Projects will mostly employ hand-building; each will start with images and a demonstration, followed by hands-on time practicing the techniques. Participants will learn how to use sprig molds, textured rollers, texture molds, and underglazes for decoration. David will also share tips on loading, firing, and testing in electric kilns. Please note that not all projects will be fired during the workshop due to time constraints. Participating teachers are asked to bring 1-2 ceramic lesson ideas to share with the group. Time will be allotted for lesson plan sharing and informal networking throughout the week. Participants may elect to stay on or off campus. Watershed will provide participants with a contact hours certificates upon completion. Good humor and a sense of adventure! All clay and underglazes needed for the projects will be donated by AMACO. David and Tracy Gamble have been teaching workshops together at craft schools and studios across the US for more than twenty years. Throughout his career, David has balanced his own art and teaching practices with his work in the ceramic industry. His work has included writing articles, developing products, and leading marketing campaigns. He has also organized and taken part in clay symposia across Europe. An MFA and an MEd art graduate, David’s current work with Skutt enables him to bring an educational focus to the company’s vision and mission. Tracy has been teaching, writing articles, designing, producing, and selling in clay for more than three decades. She has an MBA and a Master of Library Science degree and is currently a Studio Pottery Educator for AMACO. David and Tracy share a home and studio in a converted 1886 church in Plainfield, Indiana. Read Ceramics Monthly’s 2015 profile of the pair for more information on their lives and work. *Generous grant funding enables Watershed to offer Maine K-12 art educators $500 scholarships towards this workshop. To receive this discounted rate, a scholarship application is required as part of your registration. These scholarships are available to any Maine k-12 elementary, middle or high school art teacher currently teaching in an accredited public or private school.